The helmet had never fit right and now that the explosion of a bolter round had shattered the left lens it was less than useless. Garviel Loken unfastened the clamps as he squatted behind a ruined pillar and then pulled the thing from his head. His first inhalation was full of dust – from ruined buildings and other things he would rather not have thought about. Loken's disgust at what he was breathing was balanced by his ability to see properly again. He turned and glanced past the pillar at the building ahead. The structure remained largely intact and the traitors had set themselves up within it. Explosions rippled past him and he ducked again behind the pillar. With his back to the target he looked directly at the men following him. Their once sea-green armour was so dusty it was almost impossible to tell that they were Sons of Horus at one time. They were more the flat grey colour the Lunar Wolves had been and Loken thought that was so much more appropriate. He could see where the grime had been smudged away here and there and saw that some of the men had replaced parts of the armour with that of the fallen of other Legions and some purple and blue showed through here and there. All of the armour was ragged. "Dents are all we're made of," he thought before indicating to the men to advance. The heavy support squad stood up at once and missiles streaked from tubes towards the building. 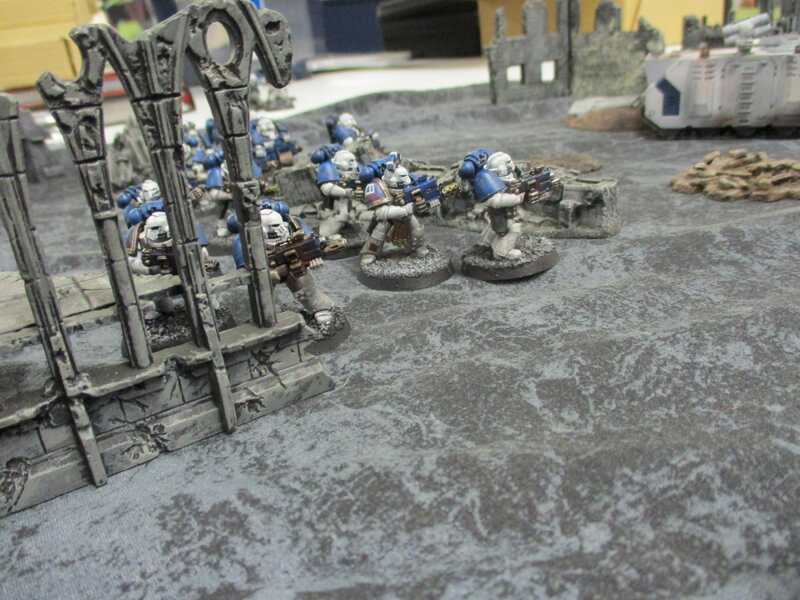 Loken ran forward following behind the projectiles, his veterans rising up from the ruins behind him and firing bursts of suppressing fire as they did. The missiles impacted the dreadnought on the second level of the building. 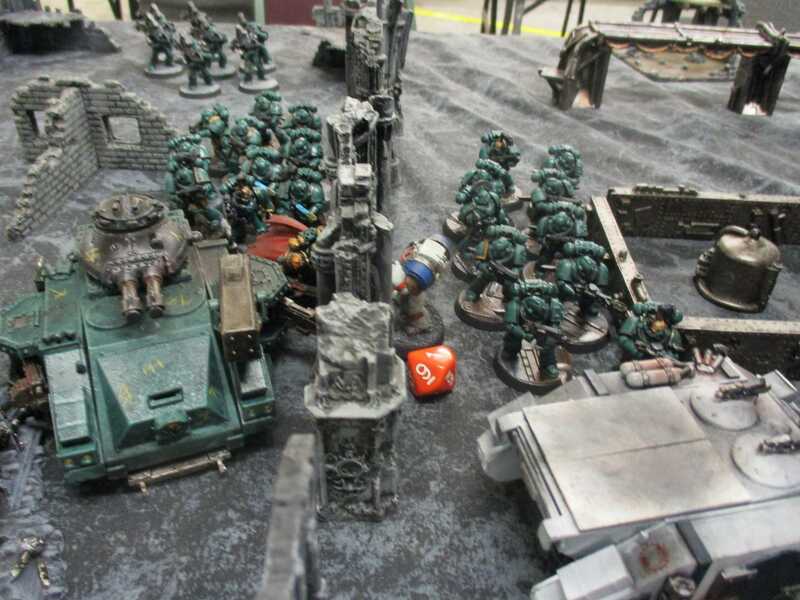 It almost looked like it would weather the barrage for a second before one of the krak missiles impaled the joint between the heavy bolter and the sarcophagus before exploding and blowing the power plant off of the back of the entombed marine. The thing staggered backwards before falling over and the Sons of Horus following Loken quickened their pace towards the building. 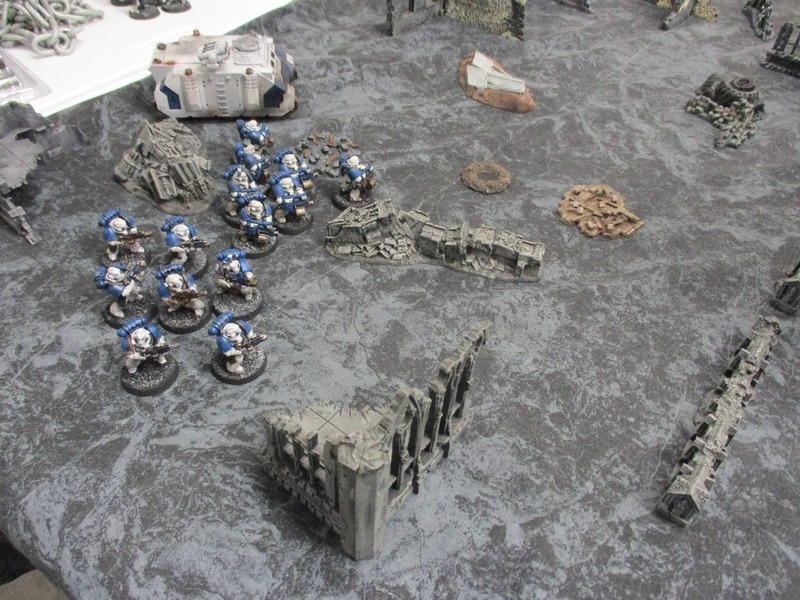 The World Eaters on Loken's right started to advance too. 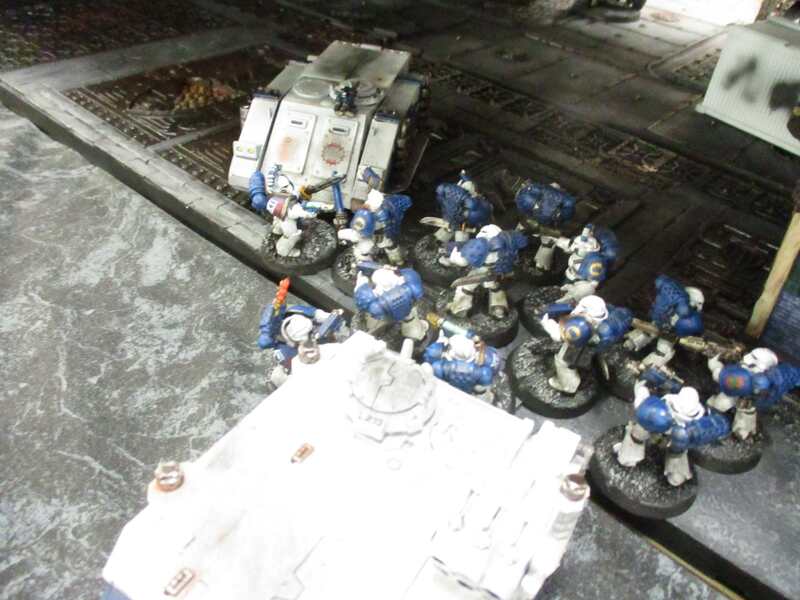 The beat-up rhino moved over the rubble and drove straight towards the objectives while marines with heavy bolters moved forward to take up firing positions to pin down the enemy on the roof. 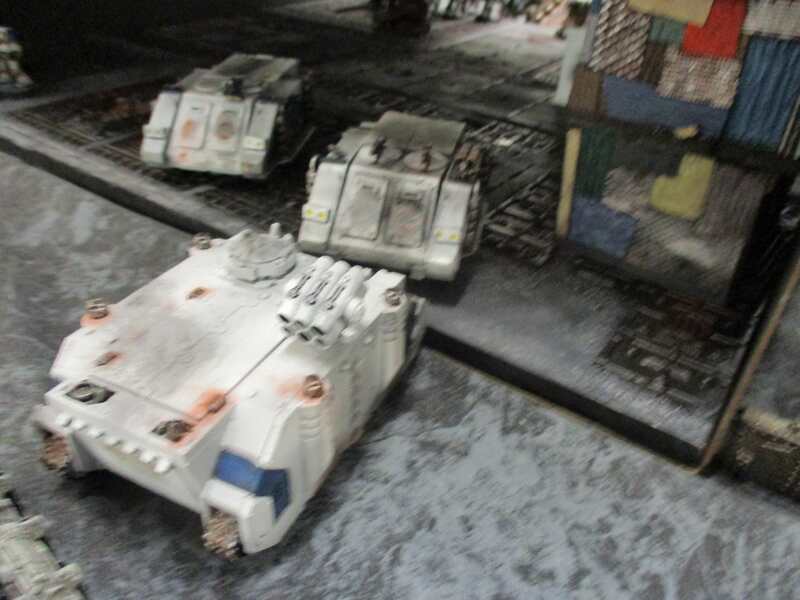 On the opposite side of the building more World Eaters advanced while the few Emperor's Children Loken had contacted lay down fire to keep the traitors pinned down. It wasn't long before the sounds of gunfire drowned out all other sounds. Having cast aside the ill-fitting Death Guard helmet he had been wearing Loken was no longer privy to the chatter on the coms. He didn't need it at this point and launched himself forward going from cover to cover. As he moved the occasional round ricocheted from his armour or exploded on it taking chunks of the ceramite away. Neither slowed him. A squad of World Eater terminators came into view, they moved forward in their heavy Cataphractti terminator plate like madmen restrained. The hum from their lightning claws could be more felt than heard as Loken set himself in front of a ruined doorway. The traitors lumbered out of the building and right were instantly enfiladed by fire from one of Loken's veteran squads. Two of the warriors went down and Loken realized that all he had heard and speculated from what he had seen about the World Eaters was true. They were descending into madness and these insane warriors were the proof. The squads fire ripped all around them but they only had eyes for Loken. He could see them screaming even if it was inaudible above the bolter fire. The door way prevented more than one of them from getting at him at a time and the first warrior was dispatched with a clean thrust through the eye. The second one had trouble getting past the corpse and Loken caught him with a slash to the back of the knee and then drove the blade up as the warrior fell catching him in the neck and almost severing the head. The last of the warriors managed to parry Loken's thrust with his claws. Loken slid the paragon blade down the enemies weapon and struck off two fingers as he did so. He ducked a savage barrage of swings from the lightning claws stepping back until he saw his opening. The blade slid into the armpit as if it had been a fitted sheath. 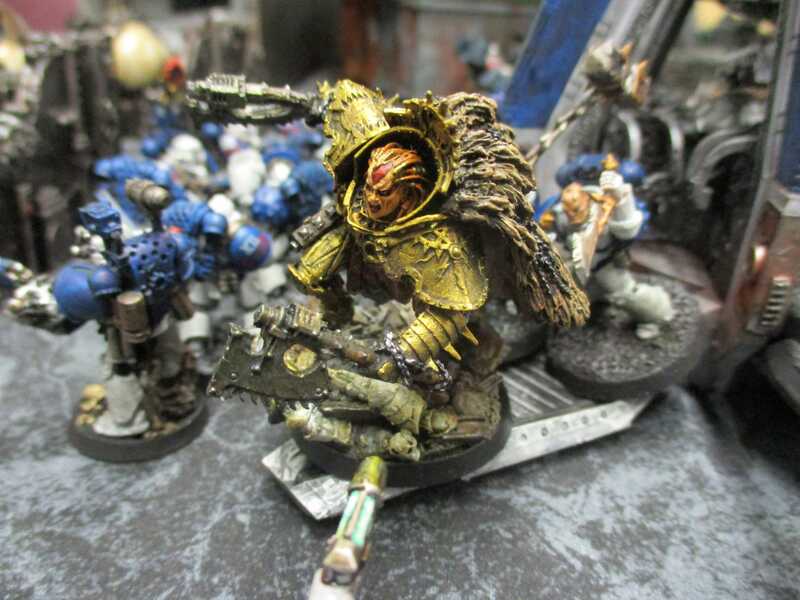 The terminator's last action was to slash wildly and tore off Loken's left pauldron before falling inert to the ground, the frothy drool around his mouth now mixing with quickly congealing blood. 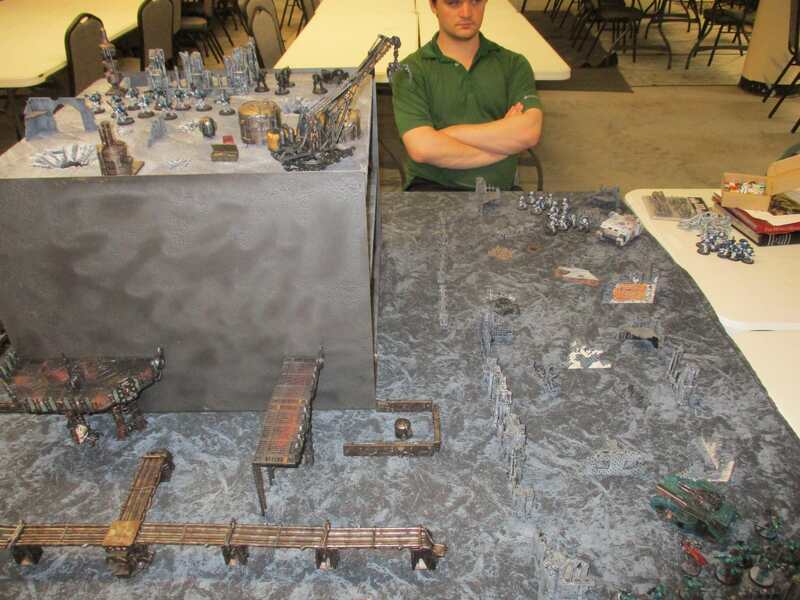 The former Mournival looked up to see a World Eater rhino speed towards them blocking their path and then being destroyed by two quick melta bursts. He and his men clamored over the wreckage. Loken had seen the drop pod fall on the other side of the building even as he had battled the World Eater terminators. He hoped it was not Angron. He was to be disappointed. He could see through the bottom level of the building to where the drop pod had landed. White arms and helmets went flying through the air spilling thick ropes of blood behind them. The Red Angel had arrived. 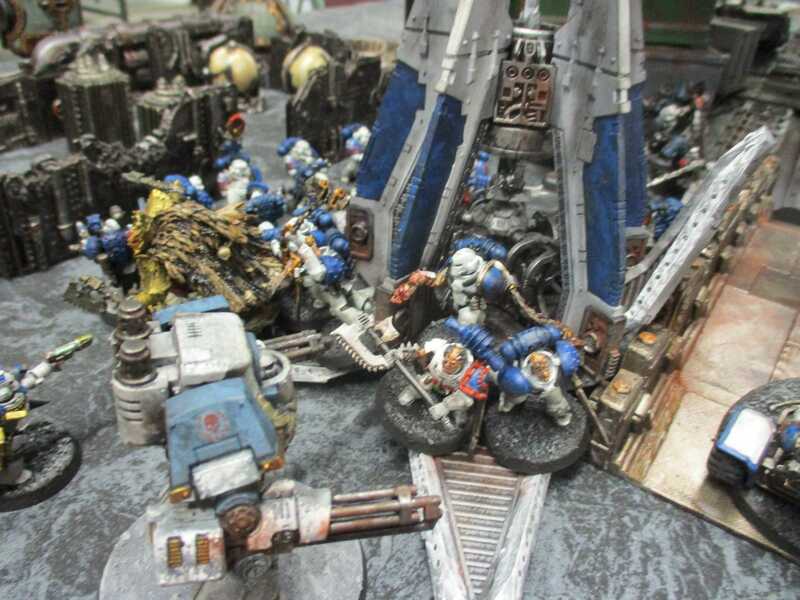 To his left the loyalist World Eaters were clearing away their traitor brothers from the bottom of the stairwell. There wasn't anything to be done to help their brothers on the other side of the building and they knew it. They stoically waited with weapons trained on the entrance. 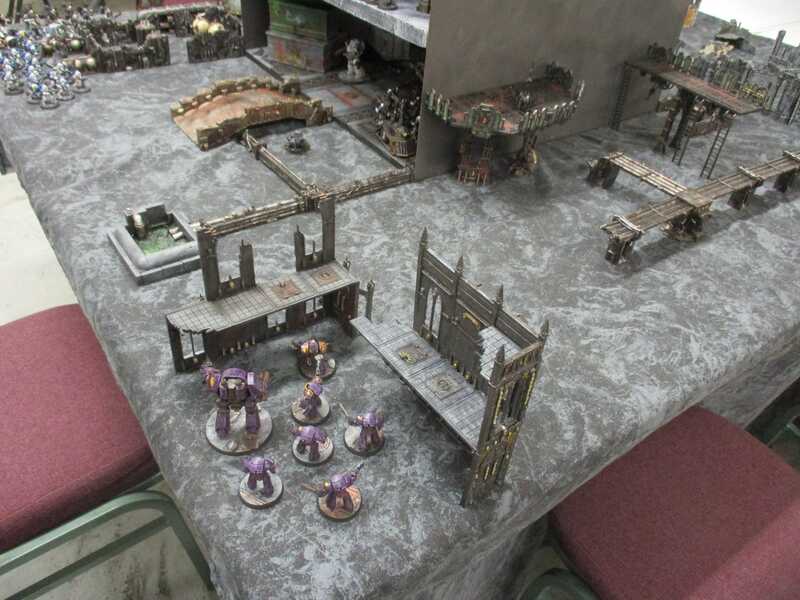 The Emperor's Children left the loyalist World Eaters to their fate as they hurried past to consolidate on the Sons of Horus position. They weren't fast enough and Angron sprinted past them trying to chase down two of his men that had fled before his fury. It was to be his undoing. The force of weapon fire that struck Angron as he came on was unbelievable. Heavy bolters, auto cannons, bolters, plasma and melta fire enveloped the World Eater primarch. They only stopped firing when he went down. A moment of silence passed over the field until he stood up. Shaky, with a loose grip on his axes, Angron stood. The gritting of his teeth was audible in the new silence, before he could properly react though the Emperor's Children were upon him. He hacked his way through two of them before the sergeant of the Terminator squad affixed the Red Angel with his chainfist. The blade sliced through armour and primarch equally easily. Angron was nearly torn in half by the thrust and went down. Garviel dashed for the stairs and was followed by his men. He and they cut their way through breachers and then assault marines on their way to the roof. Just as he kicked open the top door of the stairwell a drop pod crashed down onto the position, leaving the vehicle between Loken and his target, the virus bomb. As the pistons depressurized and the doors started to swing open Loken saw more trails of fire as more and more drop pods were raining down on their position. He had no real hope of getting to the bomb now, but he could still save his force and he dashed back down the stairs. Whatever else had happened he had thrown a spanner into the works of Horus's plan by drawing this many resources to such a remote part of the Choral City. 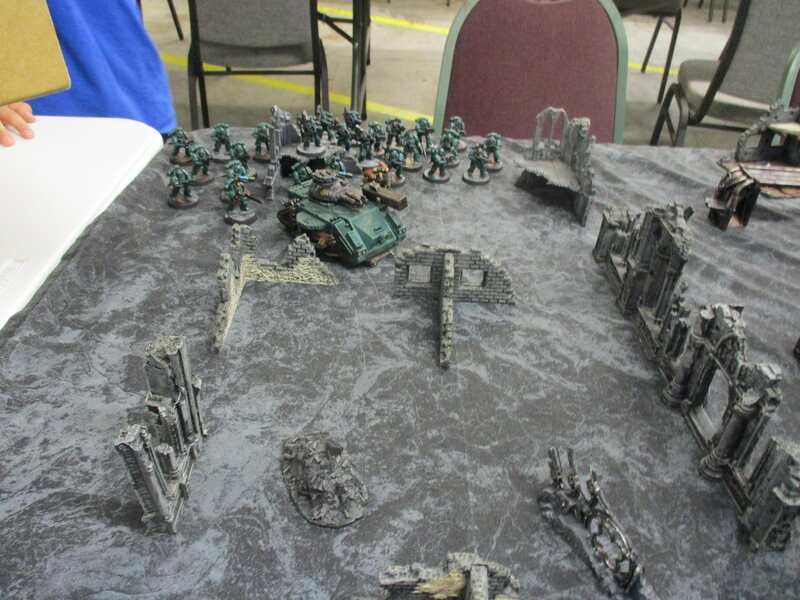 This was our first Horus Heresy game on Thursday at Historicon. 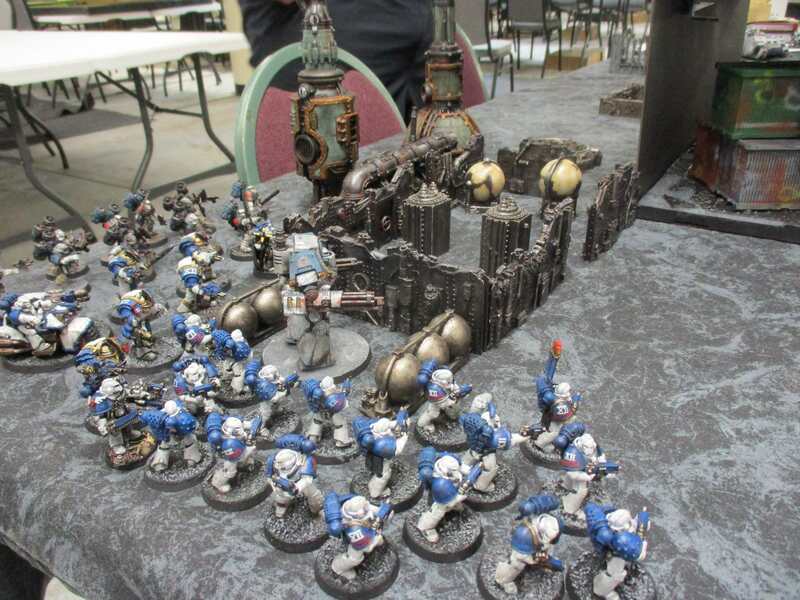 We had loyalist contingents of World Eaters, Emperor's Children and Sons of Horus vs. a World Eaters force. Angron arrived from reserves.